EPub to App is a free software program that lets you convert ebooks from EPUB format to secure applications (executable files) or apps. With this program, you can open EPUB files, extract all source files and create HTML Executable projects: with EPub to App and HTML Executable, transform your EPUB ebooks into secure applications that can be customized at will. Page navigation and formats of the initial EPUB are preserved. 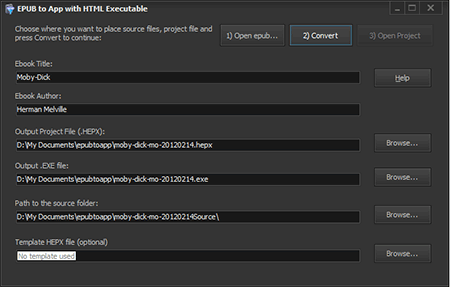 Protect your EPUB source files against decompilation and copying once they are compiled in an application file. Make user-attractive and customized ebooks thanks to the features of HTML Executable: skin, menus, toolbars, windows… may be changed the way you like. Turn your EPUB ebooks into trial ebooks so you can sell them. Disable print, select, copy, print screen key commands. Add your own menus and toolbar buttons to your ebook navigator. Distribute your EPUB ebook files safely: digital signatures with Authenticode (certificates) are supported.